Background: Pleurotus ostreatus, an Oyster mushroom, is the most prevalent edible mushrooms. It served as a nutritional diet due to the presence of essential minerals and vitamins. It has offered pleiotropic clinical applications. The production of mushroom is influenced significantly by the process parameters. 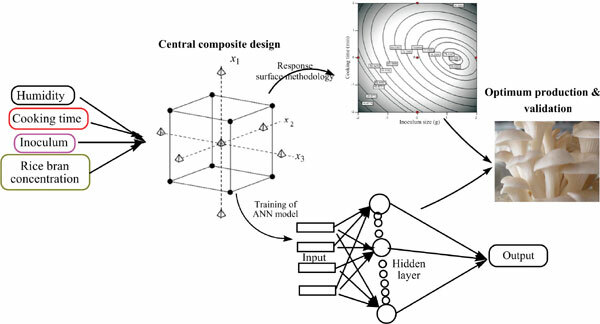 Hence, this paper is aimed to find the optimal conditions to maximize the production of mushroom biomass using both response surface methodology and Artificial neural networks (ANNs). Method: The central composite experimental design was chosen to find the optimum values of the process parameters, viz., humidity, inoculum size, quantity of rice straw, and cooking time, to maximize the production of oyster mushroom in a batch solid-state fermentation process. ANNs were trained and validated using the experimental design and its response. Results: The optimum values of humidity, inoculum size, rice straw, and cooking time were found to be 78.4%, 8.64 g, 64.56 g, and 58.15 min, respectively. The production of Pleurotus ostreatus under the optimized condition was 98.56 mg, which are two folds higher compared to the unoptimized production conditions. Conclusion: The output of ANN model was compared with the finding of the response surface methodology that showed a good agreement in the finding of the maximum production of mushroom biomass. Production, Pleurotus ostreatus, response surface modelling, artificial neural networks, optimization, oyster mushroom.